A 92-year old woman was admitted to our internal medicine ward for dyspnea and asthenia. Oxygen saturation (SpO2) was 82%, blood pressure was 100/60mm Hg, heart rate was 78 bpm and body temperature was 36.1 °C. Lung examination showed diffuse rales while heart auscultation bared a mild systolic murmur at the apex. Past medical history revealed only permanent atrial fibrillation treated with digoxin 0.125 mg q.d. and warfarin with a target I.N.R. range of 2.0–3.0. She never smoked and used EtOH or drugs. She was a housewife. The dyspnea-onset was dated the month before and characterized by slow progression. EKG confirmed atrial fibrillation with ventricular rate of 78 bpm without signs of myocardial ischemia. 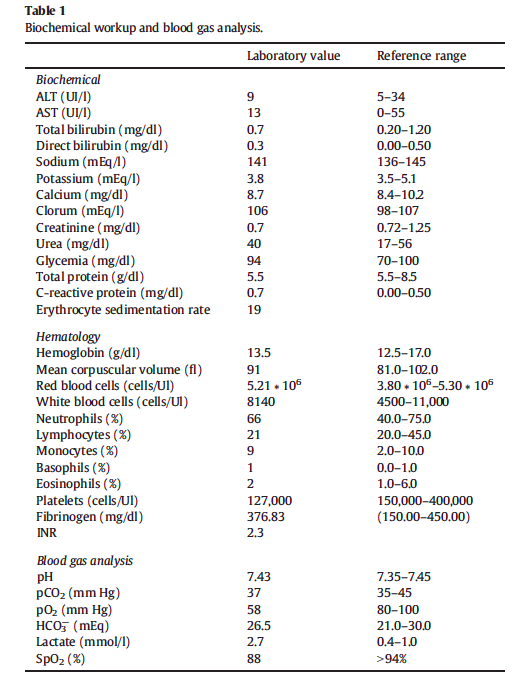 Table 1 shows biochemical workup and blood gas analysis. We promptly administered nasal oxygen (4 l/min) achieving a SpO2 of 96% and symptomatic relief. Since patient complains about asthenia and weakness, chest X-ray was performed at bed only in postero-anterior projection and it revealed an ill-defined area of increased density in the right middle lobe and homo-lateral pleural effusion (Fig. 1A). diaphragmatic hernia (DH) with abdominal viscera moved to the chest resulting in lobar atelectasis (Fig. 1B). We believe that lung parenchyma compression might mimic the lobar consolidation at chest-X-ray and explicate mild chronic dyspnea. DH is rarely diagnosed in adult age. A recently published case reported a 50- year-old female patient treated for bronchitis before the diagnosis of a posterior DH (1). A similar case was described in a 64 year old male who presented with cough, shortness of breath and weight loss before the diagnosis (2). Our case is paradigmatic for two main reasons. 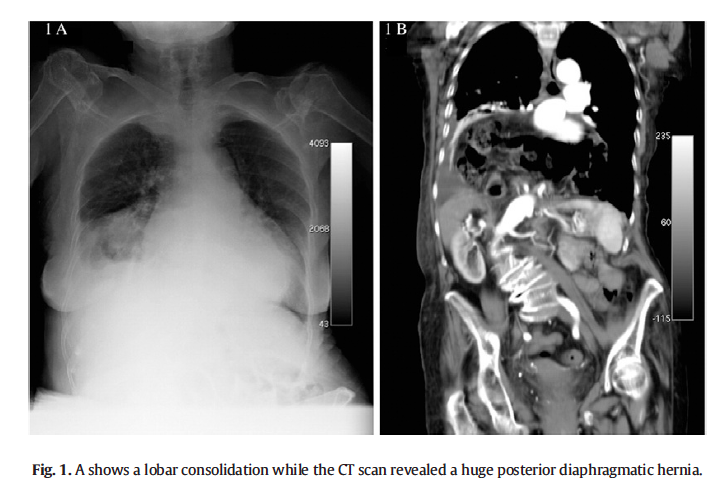 First, this is the first case of a misdiagnosis of lobar pneumonia mimicking a DH. Second, not only can pneumonia be diagnosed according to a radiological patterns, but it might also be supported by symptoms and laboratory findings. In conclusion a posterior DH should be suspected in patients with a radiological pattern of lobar pneumonia without clinical and laboratory signs of inflammatory activation. We would like to thank Dr. Filippo Tangari, MD for his fruitful suggestions in order to improve the quality of the manuscript. Zhou Y, Du H, Che G. Giant congenital diaphragmatic hernia in an adult. J Cardiothorac Surg 2014;9:31.